The Mrs. Yoy Blog: MUST. POWER. THROUGH. AGAIN. Last night was another epic night at our home. This time it was Little E who garnered the title of Worst Behaved Yoyser. At 3:49 AM (precisely two minutes earlier than his older brother the night before), Little E woke up Mr. Yoy by screaming for MAMA! I, of course, didn't hear sh*t because I had settled nicely into my sleep deprived coma from the prior evening. Mr. Yoy alerted me to Little E's screaming. And by alert, I mean a nudge to the rib. I threw on my glasses, my superhero cape, and went dashing down the hall. Little E is my good sleeper. He rarely makes a peep between the time I put him down and the time I get him up. I braced myself for the worst. I flung open his door and grabbed him. He was pee, poo, and vomit free, so that was a plus. He was just upset. Maybe it was night terrors. I calmed him down and put him back to bed. Sleep was not on Little E's schedule. I was not aware of said schedule. I repeated the crying/calming/bedding cycle three more times before I waved the white flag. We were going on an hour of crying. I prayed Big E did not get up to use the bathroom. I made the executive decision to turn on the television (again). I hate this and have tremendous feelings of guilt, but my desire to sleep overrides my desire to be mother of the year. Little E quiets down temporarily, but I cannot fall back asleep because I hear Little E sneaking towards Big E's bedroom. He wants to play with his big brother. Normally, I'm on board with this. At 5:30 AM, I say let's not wake the sleeping giant. So I move Little E into the guest bedroom with me. I pull an extra blanket down from a shelf in the laundry room and simultaneously pull down an old dust buster and a can of spray starch. I scare the living sh*t out of Mr. Yoy. Sorry for that. Little E spends the next hour and a half climbing over me, talking, and doing everything in his power to keep me awake. I concede my second night in a row of waking at 4 AM. This is awesome. At one point, Little E climbed on my chest in an attempt to kiss me. But he crossed his eyes and did this awkward lip pursing thing. 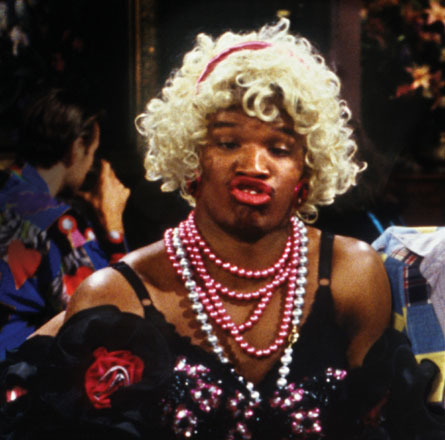 In my exhausted delusional state I wondered how Jamie Foxx's Wanda had made it into the guest bedroom. Should I laugh or cry? Around 7, Big E came out of his room and the day began anew. Big E was so proud of himself for staying in his bed all night. I mustered up a weak encouragement. Mr. Yoy and I played the who was more tired contest. I thought I should win. So did he. Somehow, I managed to get the Yoys dressed and fed and off to school. I skipped out on my Weight Watchers meeting this morning, because after eating a tray of brownies on Saturday night I was looking for a good excuse not to go, and crawled back into bed. And slept. For an hour of uninterrupted, quiet, relaxed sleep. Now I'm just watching the clock. Four hours until bedtime. I will survive. Because I have to. At 6:30 in the morning, Little E looked eerily similar to her.